The pond is hardly distinguishable behind the mass of shrub. The water level in the pond is also quite low as we have had a dry autumn but the winter rains will soon fill it up. After clearing the shrubs and some of the trees we can now see a bit more of the pond and the debris in it. The pond at Castlemaine Depot has become seriously overgrown and large tree trunks were submerged. This pond is known as a habitat for the Smooth Newt (Triturus vulgaris) and the Palmate Newt (Triturus helveticus) which are the most common of British newts. However, there is a strong possibility that the Great Crested Newt (Triturus cristatus) might also be here. More than the other newt species it has suffered declines in recent decades, both here and in the rest of its range. The idea was to clear about a third of the pond and to return to it at a later date to clear another third so that we did not disturb the habitat too much. Part of our team also went up the track to take down small trees and create some butterfly glades. Our most widespread newt, the Smooth or Common Newt, is found throughout Britain .It can grow to 10cm and is the species most often found in ponds, including garden ponds, during the breeding season between February and June. This is Britain's other small brown newt. It is a little smaller than the Smooth Newt, Whilst widely distributed, the Palmate Newt has a definite preference for shallow ponds on acid soils. 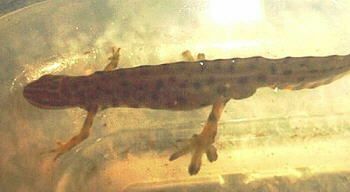 This is our largest and most threatened species of newt. 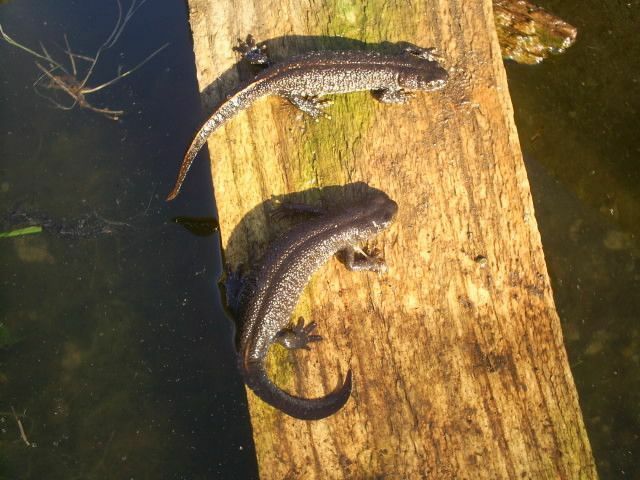 In comparison to the Smooth Newt and the Palmate Newt, the Great Crested Newt is significantly larger, growing up to 15 cm in length and looking much more heavily built. This newt is dark brown or black in colour with a more warty, rough skin. This is the pond after we had pulled out all the rotting logs. We had to use a rope winch on quite a few of the logs.